Business architecture - business goals, organizational structure, functions, processes, roles, etc. Modeling abilities of Business Process Analysis (BPA) tools cover a subset of EA: business architecture. But in addition to modeling BPA may include specialized tools like process simulation or statistical analysis. Business Process Management Suite (BPMS) must include business processes modeling, execution (process engine) and monitoring/analysis. Optionally it may include simulation, business rules and much more. Some vendors define their product as “BPM Software”. Usually this means that the system doesn’t fit into BPMS category - for example there is no engine - but marketing wants it to be labeled with BPM. BPMS enthusiasts (including myself) believe in the power of executable business processes, in “what you model is what you run” principle. The process engine is a must for them so they can’t live with EA tools only. On the other hand, enterprise architects have no idea how to handle business processes apart from the organizational structure, data and applications architecture. While many BPMS allow modeling the organizational structure, roles and external systems, it is fragmented to the level of “project” - that is, a logical business process (there may be several physical processes in the project) and do not cover the entire organization. Therefore BPMS doesn’t fit architect’s needs. Now what shall we do about it? Maybe it’s a temporary issue and BPMS will eventually grow up to EA or EA will include the BPMS functionality some day? I’d be glad to be wrong but I won’t expect this. Let’s forget about processes for a moment and look at the data architecture. DBMS is much more mature technology compared to the BPMS yet the divide between EA and DBMS is not going to disappear. Enterprise architecture deal with databases but their internal structure is modeled by specialized tools. For example, model in ARIS and export to WebMethods. Or model in Casewise and translate to Oracle BPEL. This workflow is simple, logical, but… not working well. Both options work only if we consider a single pass: draw - handover - execute. Yet BPM is not a one-time process automation excercise but management of ever-changing business processes. Now we must either transfer the details of physical implementation back to EA and find a room in the repository for them (so-called “round-trip” problem) or merge changes made in both models (like branch merging in version control systems). In theory the problem can be solved but as a matter of fact it wasn’t for years. Shall we wait more? EA-BPMS divide exists and will remain for the foreseeable future. There will be no satisfactory automatic artifacts passing between them in the foreseeable future. So where should we draw this division? There is certain freedom because the tools overlap. It’s better indeed to minimize the volume of information transmitted. This way only the list of processes and their interfaces will be transferred from EA to BPMS. Automatic export-import is not necessary for this task, we may utilize “export-import via the printer”. Every business analyst should obey the red line: never use EA tools to model business process internals if BPMS is present. 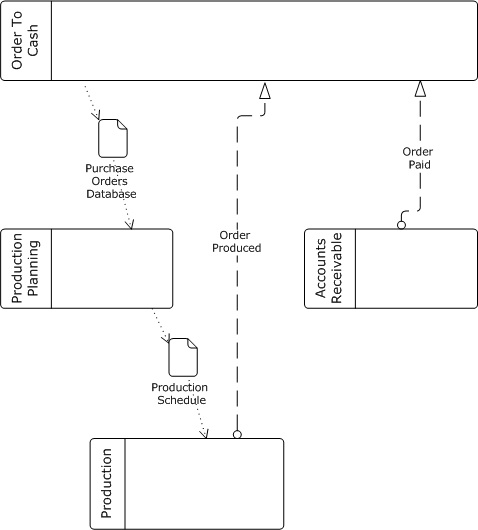 Interprocess communications can be modeled by EA tools using the so-called “black box BPMN diagram” - modeling technique presenting each process as a blank BPMN pool. Communications through messages is modeled by message flow, communications through the data is modeled by associations. Thanks Scott, without your and other bloggers’ support I wouldn’t dare to make such bold statements. 1. Top-down approach преобладает над bottom-up. 2. Учет и моделирование остается уделом отдельной группы. Основной слой менеджеров, осуществляющих реальное управление, с моделями не работают. 3. Графический инструментарий существенно затрудняет работу с данными. Thank you, wery good writing. Let me share some comments to prove your main message. 1. Import-export to-from BPA-BPM is not working. Not because it is technically impossible (I tried it works fine) but because most of BPA diagrams can not be executed in BPM without reengineering. One of our mutual colleague said that it is easier to redraw a diagram in BPMN then to refurbish it in BPA to be executable. So I think that such option is useless. Funny IDS-Scheer first announced the option to export EPC to BPMN via XPDL in 2005. Nowadays they try to sell it again for WebMethods. 3 The first one who did a step in this direction is Lombardi Blueprint. 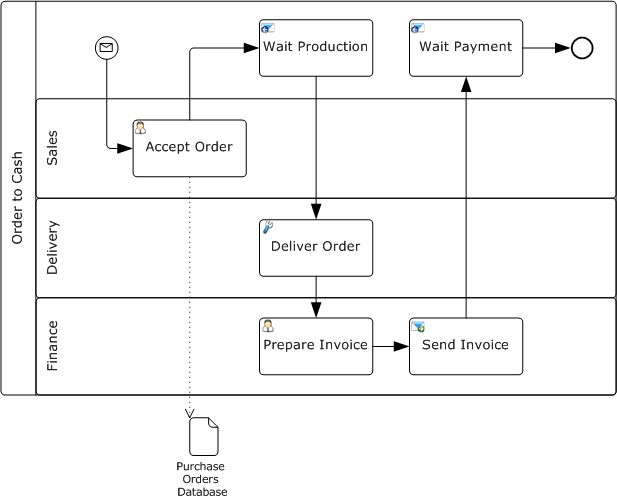 They added a conceptual modeling to BPM. Great. May be I did not investigate Blueprint deep enough and I see a lot of things to be improved, but they are on the right track. I do not expect that BPA vendors will make a step to integrate BPA and BPM. SAG having both BPA and BPM can really benefit out of this integration but I do not see any indication from their side. Big BPM players are busy to integrate BPM in to a huge product stack. First they have to buy BPA expertise. I more rely on pure BPM players. Unfortunately only few survived after acquisition wave. Great piece (sorry I am just reading it today). I have been trying to get BPMS vendors who have good BPMN tools to add more BPA-like functionality - notably a business-oriented repository of modeling artifacts: organizations/roles, goals and metrics, rules, data, etc… with no success, largely for the reasons you state. And one you don’t state… That is, BPA vendors are in the tools business. They know how to sell software to an elite few for $5000 per seat. BPMS vendors are in the runtime business. If you can buy the tools at all without the runtime, they are essentially free. I think BPMS vendors know how to make a good BPA tool worth $1000 per seat (with excellent roundtripping to the BPMS)… but they don’t know how to make a business out of it. Спасибо Автору за великолепный блог! Небольшой комментарий по поводу “водораздела в обозримом будущем”. Can you please suggest me any BPMS which is capable of importing / exporting XPDL 2.X files. Most of them do, please refer to http://www.wfmc.org/xpdl-implementations.html. The list isn’t complete e.g. it misses BizAgi which does support XPDL. The quality of the implementations is another story though: generally speaking, a model exported from one tool may look awful in another.